One of the most typical Argentine foods, from the north of the country, is a corn dish called humita. This warming and satisfying dish dates back to pre-Hispanic times, and was an Incan staple, which is why it can be found with different variations along the continent. In Argentina there are two ways of preparing this dish; one is a la olla (in a pot), and the other en chala (wrapped in corn husks). There is also a popular variety of corn filled empanadas that are called empanadas de humita. The recipe for humita is quite simple. It calls for a large amount of grated raw corn (approx. 1 dozen), 1 sautéed onion, 1 red bell pepper, paprika, ½ cup of basil, ½ cup of lard, goat cheese (optional) and salt. Everything except the cheese is mixed together forming a paste, and then for the chala version two cornhusks are overlapped forming a diamond-like shape and in the center a few spoonfuls of the corn paste are placed along with a square of goat cheese. 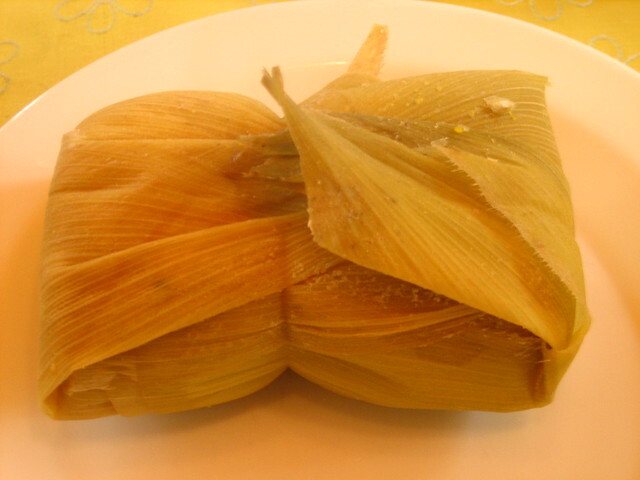 The husks are folded and tied with a small strip of the corn leaves. Then the wrapped up humita is introduced into salted boiling water for approximately 45 minutes. To cook a la olla, the mix, without cheese, must be cooked in a pot for approximately an hour. Many recipes include butternut squash for this version, and milk to make the stirring easier. This entry was posted in Food & Drink and tagged argentina, Food, humita, Incas, Indigenous tradition, north west, traditional food by Fierro Hotel Staff. Bookmark the permalink.